The Sacred Page: Aquinas in Conversation with Wright, Bauckham, etc. Aquinas in Conversation with Wright, Bauckham, etc. Joel Watts, who was kind enough to pick up the video of the Levering lecture posted below, writes: "While it may be my perspective, I do think that Thomas Aquinas is making a rather significant come back in today’s theological discussions." I'd definitely agree with Watts. Part of the reason Thomas' work has been neglected is, I think, the perception that somehow Scripture study and Systematic Theology are somehow in opposition or, at least, in competition. Moreover, theologians--especially those advocating a "narrative" approach--often style themselves as doing worthy work because they are somehow correcting tendencies which have valued philosophical methods over biblical ones. Indeed, it is true that classical approaches have at times neglected the role of exegesis in Theology. . . In fact, these tendencies are still with us! It is astonishing to me even now that one can get a Ph.D. in Theology and never have to take an upper division course in categories of biblical literature such as "Historical Books of the Old Testament!" Similarly, isn't it stunning that a person can earn a Ph.D. in theology and never have to study Greek or Hebrew!? Given that Vatican II has described the study of the sacred page as the "soul of theology" I think this is especially problematic in Catholic circles. . . but I digress. Yet--despite Protestant prejudices to pre-Reformation Catholic works as well as straw man arguments and misrepresentations to the contrary--the lack of a Scriptural focus cannot be attributed to Aquinas! I think this is helping to fuel the Thomistic renewal. 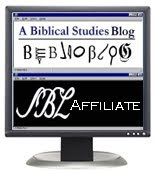 There is a great thirst for an approach that unites Biblical Studies with Theology. Thomas provides a pathway to this. Aquinas, as I've previously explained, put incredibly important emphasis on the literal-historical sense of Scripture. Indeed, he wrote numerous commentaries on biblical books in addition to his more systematic theological works. In his commentaries his exegetical caution is remarkable. Likewise, in his systematic works Scripture is given a normative role. This is evident, for example, in the programmatic first article in the Summa Theologica, where it is clear that for Aquinas sacra doctrina, i.e., theology, is synonymous with the study of the sacred page (sacra pagina). 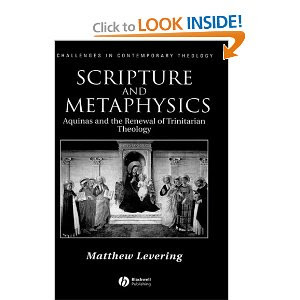 In light of this, I am especially grateful for Matthew Levering's book, Scripture and Metaphysics: Aquinas and the Renewal of Trinitarian Theology (Blackwell, 2004). Levering brings contemporary scholars like Jon Levenson, N.T. Wright, Richard Bauckham, C. Kavin Rowe, Ben Witherington, Marianne Meye Thompson, and others into conversation with Aquinas. I highly recommend the book to anyone interested in the relationship of Biblical Studies and Systematic Theology. Levering shows that a careful analysis of Thomas' body of works reveals that his metaphysical analysis of God emerges out of exegetical concerns. Aquinas' philosophical discussions of God thus principally flow from contemplation of the God revealed in Scripture. Levering in fact goes on to show that the recourse to metaphysical reflection surprisingly better preserves the biblical witness than an approach that refuses to allow for such a perspective. Indeed, he often shows points of contact between Thomas' conclusions and those reached in Jewish sources--including both ancient thinkers, such as Philo and later Jewish commentators. It is really a rather provocative and I think persuasive book that deserves much greater attention. VI: Provided that the literal and historical sense is presupposed, may certain passages in the same chapters, in the light of the example of the holy Fathers and of the Church itself, be wisely and profitably interpreted in an allegorical and prophetic sense? VII: As it was not the mind of the sacred author in the composition of the first chapter of Genesis to give scientific teaching about the internal Constitution of visible things and the entire order of creation, but rather to communicate to his people a popular notion in accord with the current speech of the time and suited to the understanding and capacity of men, must the exactness of scientific language be always meticulously sought for in the interpretation of these matters? Sorry for the post above. It seems like the first two did not take, so now you have no idea why I posted what I did. What I want to ask is if it is Catholic teaching that the Creation account in Genesis is NOT history? Or is it just "probing mystery through a symbolic and imaginative story". The PBC in the early 1900's says differently and I hear too many "theologians" say that the Creation account is myth or legend. It is also my understanding that the PBC, at this time, had infallible authority. Is this correct? My next posts will be the other questions that were answered by the PBC. For some reason, it won't take the post with the other questions. I am not sure why but I am getting no error back and the post says it took but will then disappears. Let me know if you are familiar with the other questions or if I need to try to post them again. Speaking of theologians getting Ph.D.'s without studying the Historical Books--heck, you can get a doctorate in biblical studies itself without studying the Historical Books! You can also get a Ph.D. in Bible with no Church History, Moral Theology, Systematics, or any other branch of theology.